A call has gone out for politicians to stand behind the people of Galliagh as they try to tackle huge crowds of youths getting high and engaging in anti-social behaviour on the estate. The Irish Republican Socialist Party (IRSP) based in the area made the call after placing on record their “strongest condemnation” with regards to the serious trouble in the Glencaw and Leafair areas of the estate. Party activists said that this was a situation that has been developing for a number of months and has culminated in very serious trouble in the area last night. IRSP spokesperson Yvonne Barr said this week alone has seen large groups of youths gathering “and in the process have been intimidating residents and attacking homes and cars of local people”. She added: “They also threatening to burn residents out of their homes and to damage their property. The fire service have attended fires and were pelted with missiles. “We are aware that a large number of underage youths were high on drugs and alcohol and we call on parents to be aware of the state that their children are coming home in and to take appropriate action. Mrs Barr concluded by calling for a unified community response. 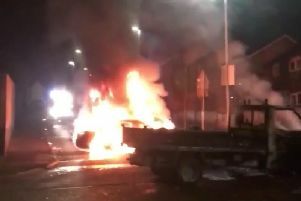 Earlier this week, the PSNI confirmed that damage sustained to tactical vehicles during the violence in Galliagh on Wednesday night will run into thousands of pounds. At a press conference at Strand Road PSNI station, PSNI Chief Inspector Alan Hutton confirmed that two tactical vehicles had sustained “significant damage”. He said: “Vehicles can be fixed but the fact remains, because of the actions of some young people we have had to take some of our vehicles, which are there to help the community, off the road. The PSNI used C.S. spray during the incidents. Residents and community workers have been raised for their response to what happened on their doorsteps this week. Sinn Fein Councillor Tony Hassan also condemned those responsible, branding their actions “disgraceful” and urging their parents to take responsibilty for their whereabouts.